Arta String Quartet or Trio provides the very best in String music for weddings, receptions , concerts and special events. They create the perfect atmosphere for your event, whether you require quality background music or something more centre-stage. 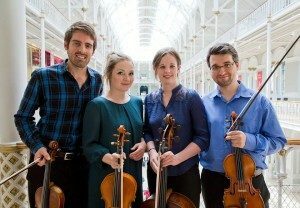 Arta , formerly known as The Erskine String Quartet, comprises some of Scotland’s leading young professional Musicians. They are all graduates of the Royal Conservatoire of Scotland, coming together to create one of the countries best string groups. They maintain a busy diary and have years of experience performing at weddings, corporate or private functions, receptions, parties, ceremonies, concerts, recordings, gigs, tours, festivals across Scotland and Europe including Italy, Malta & Spain. Arta provides live music for all events and are comfortable playing at any event and in all genres of music from Classical to Jazz and Folk to Pop. If you have a special request for music or a song not in their repertoire the group will arrange it completely free of charge. Career Highlights: Collectively they have a wealth of experience performing with various orchestras and ensembles including the Royal Scottish National Orchestra, BBC Scottish Symphony Orchestra, Scottish Opera, Scottish Ballet, Northern Ballet, Scottish Chamber Orchestra, Ulster Orchestra, Scottish Chamber Music Players and Raymond Gubbay Orchestras. Their members have also been featured in a Bank of Scotland advert, played live to 40 million listeners on BBC World Radio, played at The Commonwealth Games 2014. Famous Names: They have worked with famous musicians and bands including, Andrea Bocelli, Katherine Jenkins, Aled Jones, Rod Stewart, Kayne West, Alfie Boe, Belle & Sebastian, Ben Folds, Donnie Munro, Mary Carpenter, Nick Howard, Frightened Rabbit, Admiral Fallow, King Creosote and Mogwai. The Arta String Quartet is the perfect addition to any event.